Heat the sesame oil in a large skillet. Over medium heat, mix in the cabbage, green onion, garlic and carrot. Cook briefly, just until the cabbage is slightly soft. There is debate over whether you need to precook the veggies. My sister-in-law prefers precooking first so that the are soft and easily scooped into the gyoza wrappers. Mix in the ground meat and eggs. Cook and stir until the meat is browned and the eggs are not runny. This mixture will be the stuffing used to fill the gyoza. 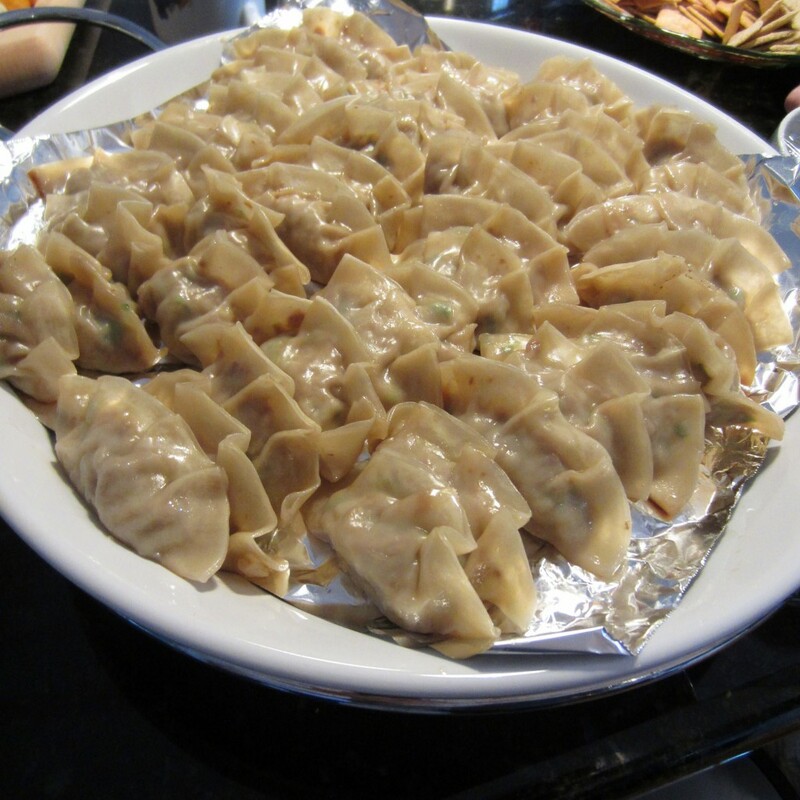 Place a tablespoon of filling inside each gyoza wrapper. Wet one-half of the edge of the wrapper with water and fold in half. It should look like a half-circle. Then, crease the round edge about 5 times. Think pinch and fold. Here is a link that gives a great tutorial on how to pinch and pleat the gyoza wrapper. Once the gyoza are prepared, preheat a large skillet with vegetable or canola oil. Cook the gyoza about 1 minute per side until lightly browned. This next step is very important and the secret to your success. Place water in the skillet and reduce heat. Cover the pan and allow the gyoza to steam until the water is gone. While the gyoza are steaming, prepare the dipping sauce.